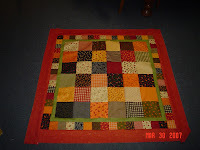 It's been a while since I have posted -- but I have been very busy working, knitting, and quilting. I will attempt to catch up on what I have finished since March. Pictured to the left is the tablecloth I made for daughter #2 for her birthday. I also made her an apron with matching potholders and dish clothes and appliqued some dish towels for her. The small square border was my husband's idea!